The last decade has witnessed an impressive upsurge in the utilization of microarray platforms for biomedical research. However, the application of this emerging technology in medical practice lagged behind. 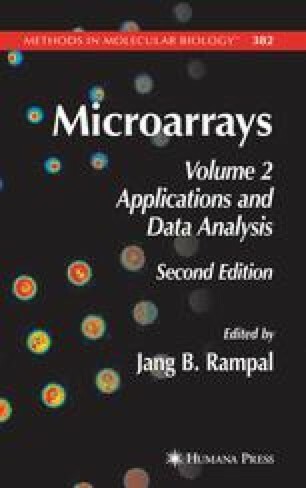 This lag is understandable because there are specific issues pertaining to the utilization of clinical samples, which has to be rigorously addressed and overcome before microarrays enter mainstream medical practice. Such issues include cost, ethics, the complexity and heterogeneity of human tissue architecture, and their corresponding diseases, the type of tissues to be used, nucleic acids amplification, and experimental variability. As microarrays enter, albeit cautiously, the frontline of clinical practice, investigators and clinicians require to set up protocols that address these issues. This chapter decribes the methods used for nucleic acids preparation from frozen and formalin-fixed paraffin-embedded human tissues using macro-and microdissection and show their suitability for use in microarray experiments.